Perennials or subshrubs, 50 cm (glabrous). Stems erect. Leaves sessile; blades linear to narrowly linear-lanceolate, 50-110 × 2-7 mm, bases weakly connate, margins entire. Heads 50-200+, in clusters in compound, corymbiform or paniculiform arrays. Calyculi of 0-1 linear bractlets 1-3 mm. Involucres turbinate, 3 × 0.7 mm. Phyllaries 2-6, oblong. Ray florets 0. Disc florets 2-6 (exserted conspicuously from involucres); corolla tubes 1 mm, throats funnelform, 1.5 mm. Cypselae linear, 1.5 mm; pappi coroniform (fringed scales), ca. 0.3 mm. 2n = 36. Flowering Sep-Jan. Alkaline springs and seeps; 500-800 m; Ariz. Flaveria mcdougallii is known only from four locations near shaded alkaline seeps and springs close to the Colorado River in the Grand Canyon of northern Arizona. Delimiting characteristics of F. mcdougallii include linear leaves with entire margins, pappi of crowns of scales, and the distribution. 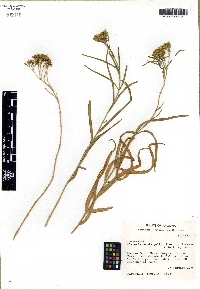 Morphologic character differences and experimental hybridization studies suggest that F. mcdougallii could well be assigned to a separate, monotypic genus.